This simple sauce is traditionally paired with Mediterranean pita sandwiches filled with gyro meat or falafel. It’s also delicious as a dip for toasted bread or raw vegetables. Try it on grilled lamb burgers, too. Makes about 2 ½ cups. Place the cucumber in a strainer set over a bowl to catch dripping water. Sprinkle salt over the cucumber and let drain for half an hour. Finely chop the garlic and herbs or crush them in a mortar and pestle. Stir the herb mixture, cu­cumbers and lemon juice into the yogurt. Season with more salt and pepper, to taste. Serve chilled. Thursday 6-8PM or Friday 8-8 at Whole Foods Market, Greenville. Any member from any of our Upstate Locally Grown sister sites may choose any drop-off any time, from the drop-down list of sites at check out. This will not affect your “Default” drop off site. WHAT’S COMING UP IN THE GARDENS? This week, we have concentrated mainly on recipes for the herbs and veggies that are in season now, and have hooked up with a few recipes for sauces made with this week’s offering. Hope you will try some of these and add some different tastes to your diet. Give them a try; I know you will like them! OCCASIONAL CSA: Every week we offer a grab-bag Occasional CSA for those of you who would like to share the bounty of our farms without formally committing to a CSA. What you will see in the occasional CSA this week: peppers, sweet and hot, heirloom tomatoes, freshly dug white potatoes, vegetable soup, eggs, herbs, with recipes for making life easy and healthier using _locally grown _foods on your dinner table. This will be over $35.00 value and really, priceless, as you will receive the freshest, healthiest produce available anywhere, harvested for you just hours before you pick it up! Here is a basic recipe for old fashioned potato salad: Mine uses much more eggs than this, but, what do you expect from an egg producer? 1.Bring a large pot of salted water to a boil. Add potatoes and cook until tender but still firm, about 15 minutes. Drain, cool, peel and chop. 2.Place eggs in a saucepan and cover with cold water. Bring water to a boil; cover, remove from heat, and let eggs stand in hot water for 10 to 12 minutes. Remove from hot water, cool, peel and chop. 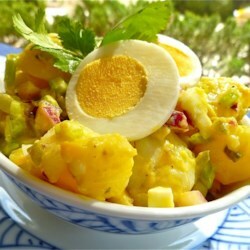 3.In a large bowl, combine the potatoes, eggs, celery, onion, relish, garlic salt, celery salt, mustard, pepper and mayonnaise. Mix together well and refrigerate until chilled. Have you ever tried the potato salad hot or warm, right after it is made? Once we tried it that way, we always prefer our potato salad hot! I also add a capful or two of Apple cider vinegar. It perks up the flavors. To add health and taste boosts, I add lots of celery seed, chia seed, turmeric, and dill. I like to add the seasonings while the potatoes and eggs are still warm. They seem to absorb the flavor that way. Want to grow some potatoes of your own? It is just about time to plant the fall crop, and Putney Farm has seed potatoes for you to order. Try them, they are fun! Lenard Putney digging fresh new potatoes for you! 1Cut the cucumber in half lengthwise and with a teaspoon scrape out the centers containing the seeds. 2 In a small bowl, blend the feta, mayonnaise and Worcestershire sauce into a smooth mixture. Fill the centers of cucumbers with the cheese mixture. Sprinkle the cucumbers with parsley and chill them for at least 20 minutes. Before serving, slice the cucumbers crosswise into bite-sized pieces. Suggestions: instead of parsley, try sprinkling celery seed or paprika on some of the cukes after stuffing. You cam order many of these products frehs on Upstate Locally Grown: www.locallugrown,net or Clemson.locallygrown.net or putneyfarm.locallygrown.net on their market page. Flowers and leaf are excellent addition to any salad and make a beautiful garnish on your plates. Nasturtium and other cresses are considered interchangeable in the kitchen and are popular in Europe and North America where they are used for spreads (especially those based on cottage cheese) and salads. In Europe, cress leaves are not commonly combined with other fresh herbs but they are compatible with the fines herbes of French cuisine and may be used together with each of them. Leaves or flowers of nasturtium are commonly used to flavour herbal vinegar and cress is also very good for herb sauces. Mix all ingredients until well blended. They can be rolled into logs and wrapped in plastic wrap. Can be frozen. Put a frozen pat/slice on roasted chicken, a freshly grilled steak, baked potato, etc. 4-6 nasturtium flowers for garnish – or can be chopped and mixed in if you wish. Mix all ingredients until well-blended. We serve the Chevre and Nasturtium Leaves Dip/Spread with crackers. If you desire a creamier consistency, add a add a little bit of milk, cream or sour cream. little bit of milk, cream or sour cream. 1/2 cup thinly sliced nasturtium stems? 1/2 cup toasted pine nuts? 2. Divide salad between 4 salad plates, top with plum quarters and pecans. Drizzle remaining vinaigrette over salads. Top each plate with 3 nasturtium blossoms. This week, we have concentrated mainly on recipes for the herbs and veggies that are in season now. Hope you will try some of these and add some different tastes to your diet. Give them a try; I know you will like them! *WE HAVE POTATOES! Lots and lots of freshly dug potatoes! Want to grow some of your own? It is just about time to plant the fall crop, and Putney Farm has seed potatoes for you to order. Try them, they are fun! Remember that “new Potatoes” are freshly dug potatoes which have not been “cured”, or allowed for the skin to dry and toughen up for storage. These will not store for months like the ones in the store, but you won’t have to worry about that, because you will be eating every morsel and craving more! The skin is very thin, so, no peeling needed. If you want to remove the skin anyway (why?) just scrub them with a brush or scrubbie. Many of the mineral nutrients are concentrated in the skin, though, so, think about leaving skin on. With these potatoes, there is no worry, as they were grown in organic soil with nothing but compost added to the growing environment. Freshly dug potatoes have so much going for them in terms of taste and texture, it’s never easy to pinpoint only one attribute, but I especially like how beautifully they roast. they are so moist that after a short time in the oven, they are just perfect. I cut the potatoes into slices rather than wedges so that more of the surface comes into contact with the hot pan and the final result is crisp perfection. Be sure the pan is hot when adding the potatoes so that they sear immediately. I weave herb stems among the potatoes for optimal flavor and to reduce the labor (no pulling leaves from the stems or chopping). 2. In a large bowl, lightly mist the potatoes with oil (or gently rub the potatoes with oil to coat), sprinkle with salt and pepper, and toss to mix. 3 Meanwhile, lightly spray (or put the oil on your hands and gently coat the herbs by rubbing) the rosemary and sage sprigs with oil and set aside. 4. Remove the hot skillet from the oven and lay the potatoes in the skillet, arranging them in as close to a single layer as possible. Roast for about 15 minutes, or until the potatoes are browned on one side. 5. Turn the potatoes over and sprinkle evenly with the onion. “Weave” the rosemary and sage sprigs between the potatoes and return the skillet to the oven. Cook, turning the potatoes and herbs occasionally, for about 15 minutes longer, or until the potatoes are browned and cooked through. 6. Season the potatoes to taste with salt and pepper. Stack the potato slices, with the herbs between them, on a warmed platter and serve. Serves 4. From Homegrown Pure and Simple, by Michel Nischan. Perilla leaves can be used in both raw and cooked applications. Extremely popular in Korean cuisine the leaves are commonly used as a wrap for rice, barbecued meats and vegetables. They are also popularly used in Korea to make a kimchee of sorts by marinating the leaves for an extended period with soy sauce, herbs and spices. Add to salads or slice and incorporate into savory pancakes, breads and stir fries. Try using as a substitute for basil in caprice salad or pesto sauce. The flavor of perilla leaves pairs well with chili, garlic, soy sauce, grilled meats and soft cheeses. Wash, dry, and roughly chop the perilla leaves. If you have raw pine nuts, lightly toast them in a dry skillet on medium heat for no more than five minutes. (If you follow a raw food diet, omit this step.) Mine came dry-toasted from Trader Joe’s. Place all the ingredients in a blender or food processor. Blend until it makes a fine paste. Taste and adjust seasonings. Wednesday: You may pick up at Whole Foods all day at the information desk. We now have heirloom green tomatoes for your dining pleasure. We will provide two recipes with your tomato order this week: one for Southern fried green tomatoes, and one for Green tomatoes over pasta. Our wildflowers are blooming their little heads off, so why not order a wildflower bouquet to delight yourself or a loved one with the fragrance of wildflowers and herbs. And, if you have someone who has a special occasion coming up, order up one of these delightful bouquets to add to the pleasure of their day? We are happily involved in a project called “Trusted Farms”, which supplies CSA’s to people’s workplaces. Since this is our first year, we elected to partner with Welch and Son Farm to create a delectable array of CSA products for the project. Yesterday was our first day, and it was a thrill to see how excited the people were about their CSA bags, (and their wildflower bouquets were really a hit!) I figure that it could be the very first time that some of these folks have ever tasted sustainably raised foods, and their taste buds will never be the same. It is very encouraging to me to know that more and more folks are waking up to the idea that food is the building block of health, and that what you eat can and will make a difference in our general well-being. Please continue to spread the word, dear friends, and set examples for others to follow! Chicken is in! We are now replenished with Welch and son whole Chickens; just in time for your week-end celebrations! Order one or more; stock up so you aren’t caught short again. Remember, folks, that these free-ranged chickens are NOT commercial chickens. What’s the difference, you ask? Glad you asked. Commercial chickens are a different breed; bred for (dangerous) rapid growth and huge breasts. They are usually raised by the thousands either in pens that allow no movement, or on floors of huge buildings where they are jammed together and can hardly move. They get no fresh air nor sunshine, either. You see, an advantage to the companies that raise hens this way is that the poultry can’t exercise and can’t really build muscle, therefore, they are more tender. This is our point here: Free-ranged chickens are free to exercise and therefore, they build muscle along with gathering good enzymes form the soil they peck. They are simply more healthy, and require no antibiotics. They graze on green things and on their natural diet: insects. (They are birds, you know) :-) They bask in the sun when they feel like it and get plenty of sunshine vitamin D. Pastured chickens are just plain better for you all the way around! One point that we would like to make here though, is that these are not fryers. The young chickens are better appreciated as broilers. Baked, boiled in a broth, or in a crock pot; in other words, slow cooking with a little moisture is the very best way to enjoy these tasty birds! Add a little onion, garlic, and rosemary, and you have a meat fit for a king! Oh, can’t you just imagine the wonderful smell of a chicken baking in the oven or crock pot with a few new potatoes and onions scattered around them basting in the juices? I’m making myself hungry, so order some chickens today before I eat all of them, Ha, Ha! For all you beef lovers: there is nothing more tasty, in my opinion, than Nature’s Beef from Taylor Farm! Since the Taylors are so convenient to us as our neighbors, we eat their beef consistently. We have always had the most wonderful meals with Nature’s Beef; no matter what cuts we have tried! One way that we love the beef, now that we have discovered it, is in the thin slices called “Philly”. We love to not only use it for Philly style sandwiches with onion and peppers on them, but we use this cut in stir fry, for hot beef sandwiches, and a myriad of ways! (Of course we love all the cuts!) Roasts are tender, steaks are tasty, ground beef is always just right, and very little fat, but still tasty! Announcing that AWA Approved Happy Critters will be joining us for the months of July and August right here on the USLG sites! Order now while you can! Remember that we have more and more veggies as the weather warms up! Look under the heading of Produce/Vegetables. Here is a photo of the ad for our AAFA farmer’s market, an all-producer market for sure! We have lots of fresh sustainable produce ready in the fields and gardens and plenty of protein for you, too. It is not too late to order if you do so before noon Monday; drop-off schedule for all is below. Here are the links to the Markets: Greenwood, Clemson/Anderson, and Greater Greenville. Drop-off Tuesday in Anderson at the Anderson Farmer’s Market, Downtown Anderson 5-7, in Greenville at Swamp Rabbit Café and Grocery 4-6, Wednesday 1-2 PM Tractor Supply Parking lot Greenwood, and Wednesday 8-8 at Whole foods Market service desk. Please remember to watch for your confirmation email after you order so that you know your order went through. If you don’t get your confirmation, your products are still in your cart, where we can’t see them. To make your deposit, hit the “Donate” Pay Pal link anywhere on the web page and use check or any major debit or credit card. or click the link below. If you need help, please message me 864-353-6096 or email this link. Hello folks! Tomatoes will be ripening this week! Yeay! And summer squash is in full swing! Lettuce is on its way out. More Beef Cuts are available, and chicken backs and frames are plentiful for those new “Paleo” diets. Your market is open for ordering directly from our featured growers. If you would like to get an order in for Tuesday pick up in Greenville and Anderson, or Wed in Greenwood, please go to www.upstatesc.locallygrown.net, greenwood.locallygrown.net, or Clemson.locallygrown.net to order from the market page. Vote for clean, pure, local food with your food dollar. Now that summer is here, more and more fresh veggies are popping up on the market list, which makes it even more exciting to figure out which goodies we will be choosing this week. Remember that every dollar you spend on Upstate Locally Grown and its sister sites is returned to the community and not shipped thousands of miles away. When you order on our USLG network, you are ordering directly from the grower or artisan, and this helps our local economy. Let’s even the score:Spend your credits; Pay your deficits. Some of you might want to take advantage of the opportunity to use up your credits by ordering some things that you can’t get at the corner store. And those of you who may have forgotten to pay for your last order, no matter how long ago it was; it is still not too late to make things right. We will gladly and freely forgive this, as we realize that anyone can overlook something like this. It is easy to not remember to go back and settle the balance after the fact of ordering. Remember that we aren’t a “middle-man”, but a vehicle through which you can order directly from local sustainable growers, and that the grower himself gets a generous 75-90% for his products. This is great! We love to support and promote or fellow growers. However, this leaves our market with a very small margin to operate with, which is okay; our needs are few, but if several folks forget to pay, it Kind of leaves us hanging. *CSA We are excited to partner with our trusted friends to bring you a vast array of delicious produce! We have a few openings left for a seasonal CSA from the Putney, Spurgeon, and Welch gardens. The $35.00/wk CSA will be chock full of seasonal Veggies and easy, mouthwatering recipes for using them. All produce is organically grown. We strive to give you a rich variety of delicious edibles; greens, root vegetables, herbs, and beautiful cut flowers. If you would like to add eggs, dairy, and/or meat to this, the option is available. Please let us know if you are interested in knowing more and we will give you a run-down of the details. We will be posting the dates and details soon on the web site, however, please reserve your spot with us ASAP, as most of the spots are filled already, and we would love to add you while we still have room. While the market may be open until Monday at noon, the earliest orders get all the good stuff, so please get yours in quickly. And please check out the category called “Recipes” on the Market page for ways to use your goodies. Or, you can type in the name of your product in the space provided on the market page and come up with some recipes containing the product. Please “Friend” Putney Farm and Upstate Locally Grown on Facebook. We post on many educational and interesting subjects on poultry, sustainability, permaculture, nutrition, and homesteading skills that you may not see otherwise. Drop-off Tuesday in Anderson at the Anderson Farmer’s Market, Downtown Anderson 5-7, in Greenville at Swamp Rabbit Café and Grocery 4-6, and Wednesday 8-8 at Whole foods Market service desk. Please remember to watch for your confirmation email after you order so that you know your order went through. If you don’t get your confirmation, your products are still in your cart, where we can’t see them. Hello Folks! Just a little reminder that ordering is about to close for this week on the Upstate Locally Grown Network: clemson.locallygrown.net UpstateSC.localygrown.net and Greenwood.locallygrown.net. Remember that you may choose to pick up at the Anderson Farmer’s Market where Putney Farm and others of your favorite growers will be joining other AAFFA members for a great sustainable market fron 5-8 on Tuesday. Clemson folks will be picking up there from now through August, and All of the Upstate may choose that pick up by just making a note on your order. Mrs Spurgeon is baking pies today, and is getting the ingredients together now, so, hurry, get your orders in quickly.